The first thing that happened in the past couple weeks was the resetting of one of the tanks. This was because the substrate that was originally ordered for Tank #1 was way too fine and caused the entirety of the tank to turn into a giant mud pit of clay. After waiting several days for the substrate to settle to the bottom, I had to empty the entire tank of water and scoop out all of the substrate by hand and rinse it until there was no sand remaining. After the tank was clean, I filled all of the water back in with clean water and completely rebuilt the environment with more coarse substrate. The next thing that happened was that there was a lot of research being done on the lighting schedule and what what works best for most people. This search ended with a phone call to Zack where he walked me through all of the different options for programs. After the lights were all sorted, I had to plan out the next steps as far as coral introduction goes. After the first semester was starting to wrap up, I set a goal to get the corals in before February, water conditions permitting. This meant that a lot of the remaining physical construction that needed to be done needed to be expedited. This was evident once I placed the corals in. 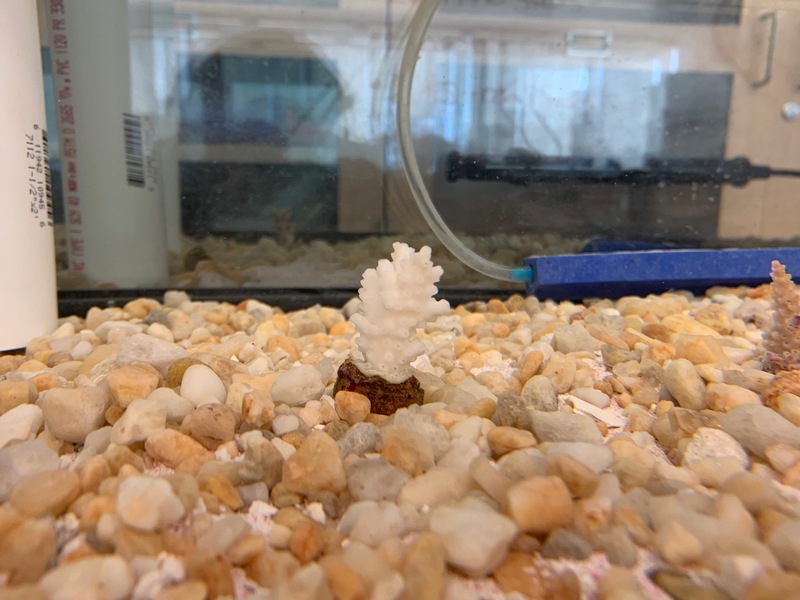 This is because I did not have the platform grid at the correct height which meant that some of the corals started to bleach immediately due to the high intensity of the light. However, I was able to catch it in time that I only lost three frags. This means that the experiment is still able to go on. As far as the next week goes, there is a lot that needs to be done and monitored. 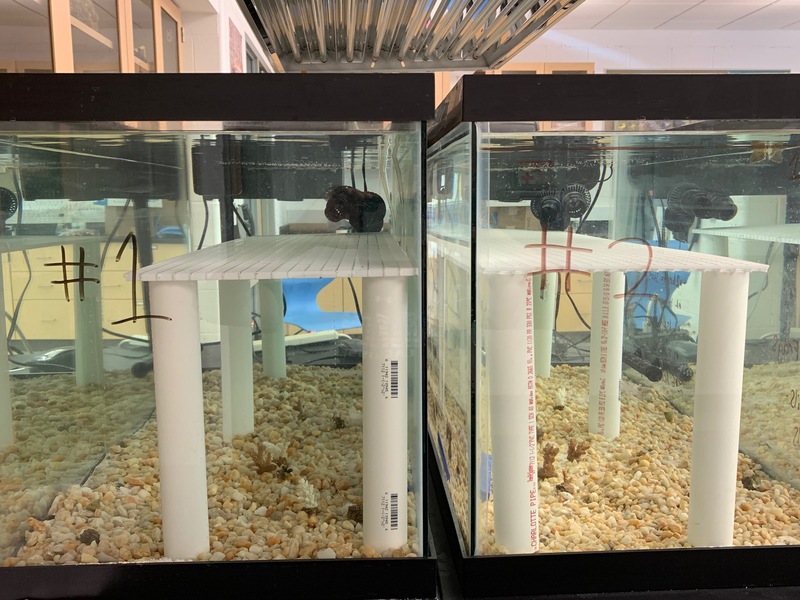 The most important thing that needs to be done is adjusting the height of the platform because if the corals are on the ground for too long, they could become subject to infection. The next thing that needs to happen is consistent testing of the water parameters. The last thing that needs to be done is the corals that are slightly bleached are going to go under the microscope for further understanding of what is really happening to them. This is a picture of the final setup as of 1/25/19. This is a picture of one of the bleached frags. 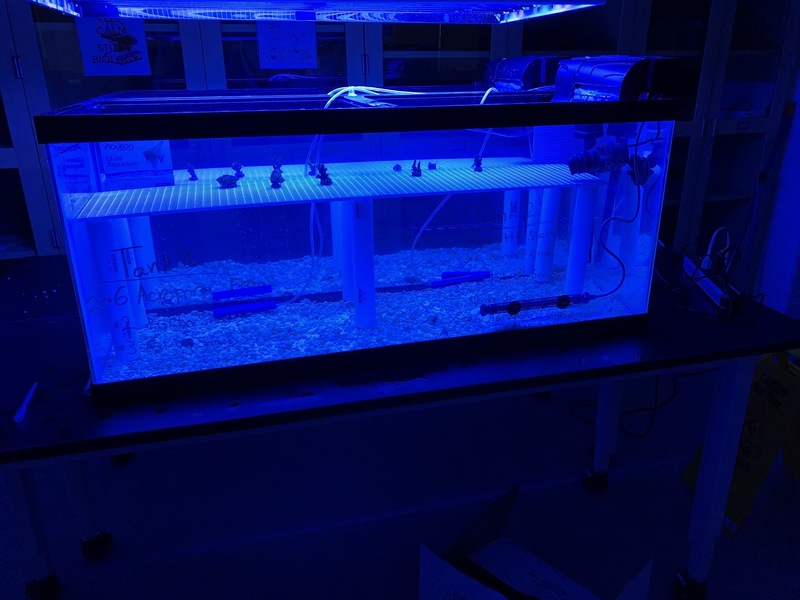 This is a picture of the setup with the frags on the bottom of the tanks to help with the lighting issue as of 1/28/19. As a reader of your blog from the 1st semester, it is super exciting to see all of the progress you are making! Keep up the great work!